"We looked at this as an indicator of how powerful a free and open internet can be in the world, and we looked at this from that lens," Nakasone said in remarks to a security conference in Aspen, Colorado. "But I would also say that our adversaries looked at it from a completely different lens: As an existential threat to their existence." "And so what have you seen since then, I would say, is the weaponization of information," Nakasone said. "The idea of being able to control a populace with disinformation." "I think that is an incredibly important trend that we're starting to see," he said. Both states are "operating below the threshold of war," he said. Russia's recent information warfare operations have involved the use of hard and soft power, such as the so-called "little green men" in Russian military uniforms without official insignia deployed to help take over Ukraine's Crimea and combined with aggressive disinformation operations to support the eventual annexation. Another example was Russia's cyber-enabled intelligence operation to influence the 2016 presidential election by hacking political organizations' networks and posting stolen emails and documents online. "We've recognized the importance of hybrid warfare within our Army, within our Marine Corps on the ground," he said. "We've already started to take action to train at places like the National Training Center that incorporates the idea of information warfare with a ground combat element." Nationally, the United States needs to address information warfare threats and take steps to counter them using what the four-star general called "a whole-of-nation of approach." "And I do think our nation is capable of it," he said. "It's not something new. This is something we have. I certainly grew up with it during the Cold War, and [we] have done it very effectively and I think we will do it again." In addition to the foreign weaponization of information, Nakasone said a second trend in cyber threats is the targeting of large data sets. "The stealing data, the importance of being able to secure your data. This is one of the trends of the past couple of years that I've certainly noticed," Nakasone said. China has been blamed for stealing massive quantities of both U.S. government and private sector data. The Chinese were behind the theft in 2015 of more than 22 million records on federal workers, including extremely sensitive data on security clearance holders that can be used by China for intelligence recruitment and future cyber attacks. China is believed to be using the massive data to assist with the use of advanced artificial intelligence technology. Nakasone said China's development of artificial intelligence is being watched closely. The United States remains a leader in technology innovation and as a result will be able to compete against the Chinese in the development of artificial intelligence, he noted. Over the past 10 years, cyber threats have escalated from foreign nations' breaking into U.S. networks and stealing data, what Nakasone termed "exploitation" or spying. "And that advanced to disruption," he said. "This is the whole denial-of-service attacks that we've seen from our adversaries." At the higher end of cyber attacks is the use of cyber means to cause destruction of data, networks, and equipment, such as the North Korean cyber attack against Sony Pictures Entertainment in 2014, he said. Regarding the threats from Russia and China, Nakasone said "we have to have some manner upon which we're going to have to be able to contest them in places like cyber space." "If we don't, if we decide we're going to stand on the sidelines, that we're not going to bring the powers of our nation against our adversaries in cyber space … I think we run the risk of our adversaries defining what they are going to do in this domain." Debate is needed on the costs and benefits of confronting Moscow and Beijing in the cyber realm, he added. "But that discussion has to take place, and that discussion also has to take place with the idea of are we going to contest our adversaries in this new domain," Nakasone said. On the risk of U.S. cyber attacks escalating in a future conflict, Nakasone disputed the idea that such attacks will automatically increase the danger of larger conflicts. "Maybe our adversaries do not want to escalate," he said, adding that they may prefer to continue to wage low-level conflict in the digital arena. "But my concern is that if we do not bring the full elements of our nation's power against our adversaries in this space, if we don't decide that contesting them or engaging them is important, then I think our adversaries have a much easier time of defining what they're going to do." Nakasone said NSA has set up a special unit called the Russia Small Group that is focused on monitoring Moscow's attempts to try and influence the upcoming 2018 elections in November. Russia poses a "near peer threat" to the United States in the cyber realm. However, Cyber Command is prepared to act against Russia in a cyber conflict if called upon to do so, Nakasone said. Earlier last week, Thomas Bossert, former White House cyber security chief under President Trump, said the concept of nuclear deterrence against adversaries is not applicable to cyber space. "In nuclear war you're either at it, or you're not," Bossert said during the same conference. "News flash: We are in cyber conflict. And we've long joined it. And there's not a country on this planet that's not in it." The United States is in "a constant state of not just low intensity, but in some cases intense conflict online," Bossert said. "So the deterrent thinking of nuclear war does not apply. If you think that we're going to deter someone by escalating further the conflict that we're already in, I think you've misapplied your previous thinking." Bossert said Russia carried out the June 2017 NotPetya cyber attack against Ukraine that took down networks of the government and business, but Moscow put no constraints on the malicious software that then spread globally. The malware hit businesses in Europe with cyber attacks that caused $10 billion in damage, including the shutting down of three port facilities, he said. "The Russians could have easily constrained the propagation of that cyber tool to the Ukraine, but they didn't," Bossert said. 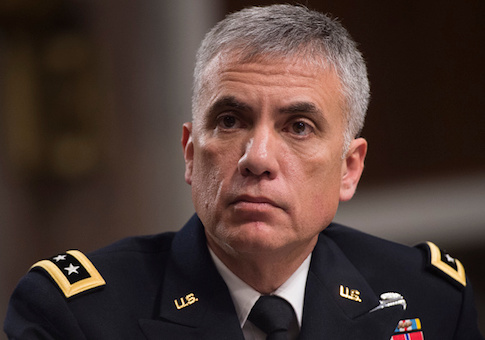 Cyber Command has adopted a doctrine called "persistent engagement," Nakasone said. "We should anticipate in this domain, within cyberspace, that our adversaries will continue to penetrate and continue to try and penetrate such things as our critical infrastructure," he said. "What should we do about that? I say I think it's both the idea of being vigilant about that, certainly. It's also the idea of being able to act forward in terms of what your understanding what your adversaries may be doing in their own networks." Last, cyber forces will enable action. "What's the partnership that's most effective to ensure that the Department of Homeland Security is armed with and has the information and both the capabilities to deal with this type of threats," Nakasone said. Nakasone said security for weapons should be "baked in" to the systems and not applied as an afterthought. Secondly, intelligence agencies need to conduct aggressive cyber intelligence operations to learn what adversaries' capabilities, plans, and intentions are, he said.